Exchequer Integration ecommerce online ordering - Ocean Ecommerce. Ecommerce consultants. Exchequer e-commerce enterprise level integration for both trade orders and retail sales direct to the consumer. The Ex-Commerce Exchequer Integration package gives you fully integrated 'virtual real time' stock, discounts and customer synchronisation with Exchequer. Why is integration important to my business? Our Exchequer integration e-commerce solution will automatically synchronise your on-line shop with your Exchequer in near real time. As you change product information such as stock levels, pricing, discounts, customers and more in Exchequer - these changes will automatically be transferred to your on-line shop. When a new customer registers on the web site and successfully makes a payment their details will be transferred into Exchequer each with their own unique account code. Orders taken will also be transferred to Exchequer sales order daybook reflecting their account status and all relevant discounts. "If you're not trading online, eventually you will not be trading at all . 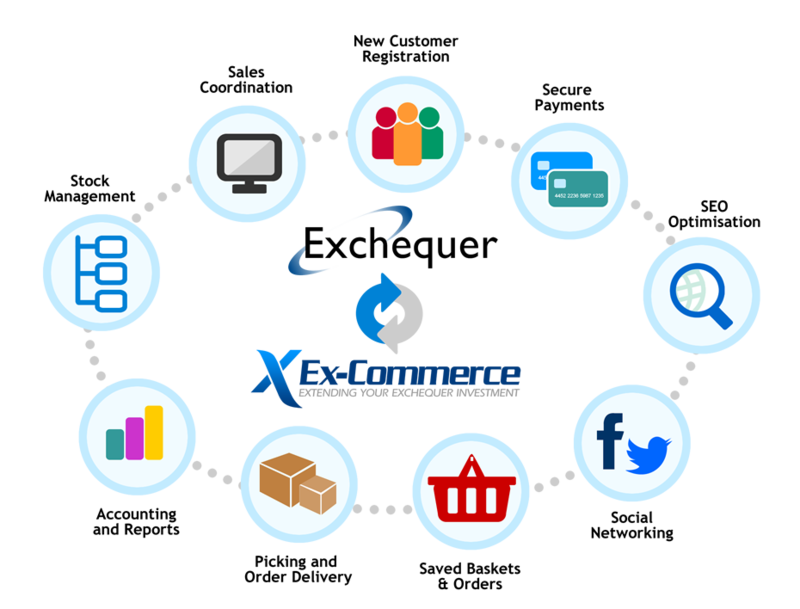 . ."
Unlike any other e-commerce product, Ex-Commerce has been designed from the ground up specifically to create a full integration with Exchequer. 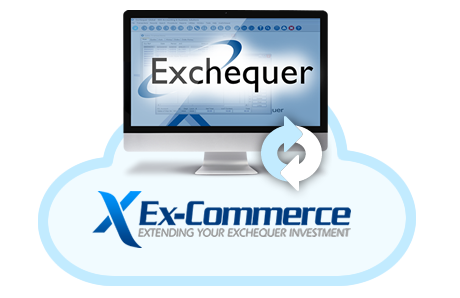 Exchequer allows users to set up variable discount structures and price banding on both customer and stock level. Add to this the additional layers of currency and variable Tax per item it creates a complex discount matrix that other e-commerce systems simply cannot cope with. We have developed the Ex-Commerce Exchequer integration to fully replicate all the functionality of Exchequer, it will automatically synchronise all the pricing, discounts, tax, and currency variations to your e-commerce shop with 100% accuracy. Customer accounts are an important part of the system and Ex-Commerce will automatically transfer new customer accounts into Exchequer each with their own unique customer account code which fully conforms with Exchequer so both the web system and Exchequer use the same account reference. In addition to this, multiple departments or staff within a single organisation can be assigned to the same account in Exchequer making it the only fully integrated B2B and B2C solution on the market. We have a complete live demonstration facility to prove the concept of all features and functionality. Please contact us for a demonstration of how Ex-Commerce can transform your on-line business presence. Whether starting from scratch or needing a revamp of your existing web shop Ocean Ecommerce can help you find the right solution and build a site that is both unique and powerful. We specialise in e-commerce data synchronisation making the internet an integrated part of your business. This brings you efficiency and profitability with the minimum of investment. Our solutions can be tailored to work with virtually any back-office database system, and this can be adapted as an ongoing development so that if you change stock management systems in the future your e-commerce will simply keep running. This avoids any down time or re-investment. We will be more than happy to discuss your project and give you free impartial advice without any commitment from you or annoying nuisance marketing from us. The simple truth is what you need and that's what you get. Copyright © Ocean Ecommerce 2019. All rights reserved.